Congratulations to our 2015 Learner Award recipients. They definitely deserve all the applause from the audience at our PGI showcase on May 31. They are indeed our shining stars! Kristy is one adult learner who has pushed through all boundaries and challenges. Ever since she received her high school leaving certificate around 2006, she has been trying to figure out the next step in her life goal. Kristy was a quiet and shy individual who does not express much. Her one true passion, however, is wanting to be an ECE teacher working with young children. Life has posed challenges on Kristy. That did not stop her from searching ways of improving herself. Through the years, Kristy has moved away from her shyness and has become a strong advocate for her own learning. She is currently working on two separate programs – her Haida Language Teaching Certification with UNBC and Early Childhood Education course with NWCC. She is a self motivator and has strong ideas on what she wants in life. Lorraine is someone who was not defeated by learning barriers. During the six weeks of Job Options B.C. 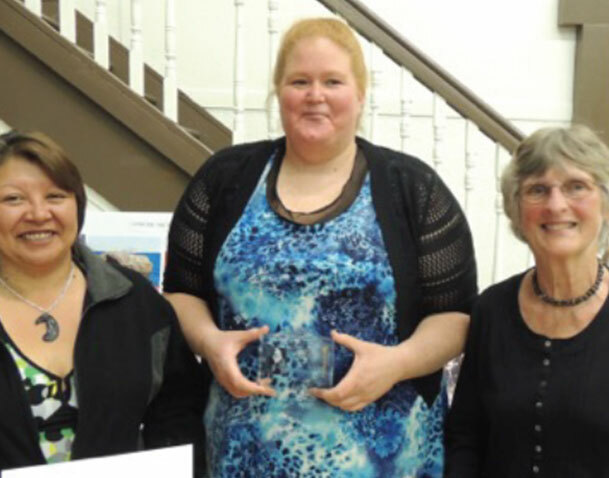 program in Masset, Lorraine transitioned from the status of ‘unemployed’ into a fierce readiness that has had a tremendously positive impact on everyone in the group. She paid attention to details and demonstrated enthusiasm for the program. She is reliable, energetic, and very considerate of others. She has a natural ability to lead with confidence. Jennifer started accompanying her husband to senior computer class about a year and a half ago. She had always quietly sat next to him, watched him work on the keyboard, surf the internet, write email. She was quietly learning at her own pace. She once exclaimed she could never learn how to use the computer at her age. However, after much encouragement, she decided to give technology a try. Once she understood where the power button is and how to maneuver around the computer screen, Jennifer eventually gained confidence in handling the technology.